Huntington Beach State Beach extends two miles from Beach Boulevard in Huntington Beach south to the Santa Ana River on the Newport Beach boundary. Phone (714) 536-1454 for more information. Two covered picnic areas at Lot #1, and four covered picnic areas at Lot #7, are accessible, including parking and the route to the picnic areas. Accessible outdoor rinsing showers and drinking fountain are nearby at both locations. 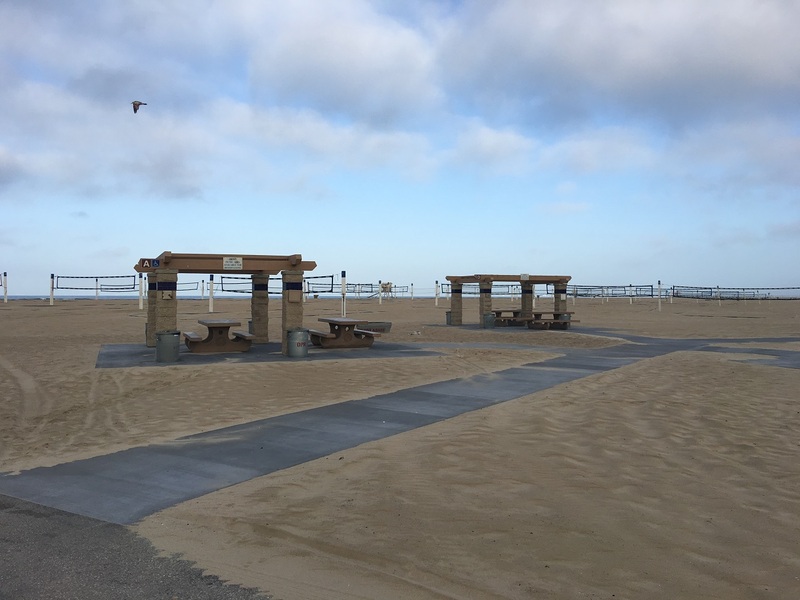 The accessible Huntington Beach Bike Trail extends 1.9 miles along the entire length of Huntington State Beach. Continuing north on the bike trail beyond the limits of Huntington State Beach takes you to Huntington City Beach and eventually to Bolsa Chica State Beach. Total length of the bike trail is nearly 8.5 miles from the southern tip of Huntington State Beach to the northern tip of Bolsa Chica State Beach. The bike trail is a popular paved trail used by hikers, bikers, and roller skate/blade users. The trailhead, mostly accessible parking and accessible restroom are at the south end of park. Accessible entry is also available from any day use lot. 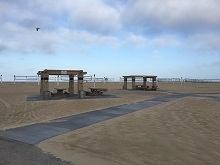 Huntington Beach has 4 wide, paved paths departing from various areas of the multi-use trail that lead to the beach at about high tide level. They are accessible, but include some slopes at the beach end. Two paths at the south end of the beach lead toward the beach and are mostly accessible. Shade structures with accessible features are available at the foot of both Newland Street and Brookhurst Street. Designated accessible parking and restrooms are near these areas. A beach wheelchair is available at the Magnolia Kiosk for visitors to use. Call (714) 536-1454 for more information.